Northamptonshire begin the defence of their NatWest T20 Blast crown at home to Derbyshire with the unusual feeling of expectation hanging over Wantage Road, for the Steelbacks can play the underdog tag no more. Alex Wakely’s men have enjoyed playing up to it in recent years, none more so than at Edgbaston last August, when Nottinghamshire, Yorkshire and Durham arrived at Finals Day with sides packed with internationals, but it was little old Northants who walked away with the title, for the second time in four years. Indeed, the final was the third they have contested in that period, only missing out in 2014, having been runners up in 2015. So whilst they may not be the most fashionable county, they are now a force to be reckoned with in the shortest format. The squad has remained almost unchanged, with Nathan Buck replacing Olly Stone, who missed much of the title campaign injured. Seekkuage Prasanna also returns next week, with South African spinner Thabriz Shamshi filling in for the opening three games. That familiarity means a side who know their roles, and one that is full of match winners. A trademark of last year was the ability to always have someone step up and play the crucial role when needed, rather than relying on two or three star names. The Falcons meanwhile will arrive at Wantage Road, looking to cause an upset and show that their winter talk of making an impact in T20 can be put into action. One of only two sides never to have qualified for Finals Day, Derbyshire’s only solitary appearance in the knock-out stages came all the way back in 2005. However, in a county first, John Wright has been appointed as a specialist T20 coach, with winter signing Gary Wilson taking the reigns for the competition, and it remains to be seen if the new approach can pay dividends. 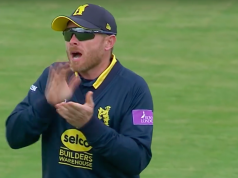 With the trip to Northants followed by a local clash with Yorkshire at Chesterfield on Saturday, they certainly face a baptism of fire and one that could set the tone for the season. Ben Duckett was simply the man of 2016, his summer in the sun including a remarkable 83 as Northants beat Notts in the semi-final. He also impressed in three ODIs for England before a difficult spell in the test arena saw him drop down the pecking order. 2017 hasn’t started the best, but two centuries in successive Championship games show a return to form, and he will no doubt produce his full compliment of reverse sweeps and Duckscoops. Imran Tahir made his Derbyshire debut this week, following his white ball commitments with South Africa, and immediately took 5-110 in the first innings of the Championship clash with Durham. The leg spinner has become one of the highest ranked T20 bowlers in the world, and alongside Matt Henry will provide an added dimension to the Falcons attack. He also has good memories of Wantage Road, taking 3-13 to spin Nottinghamshire to victory 12 month ago. Northants will be without Muhammed Azharullah after he suffered a tendon injury in the Championship last week. 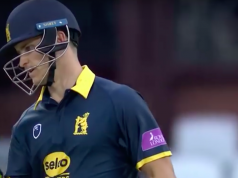 Richard Levi is also a doubt, having suffered a concussion against Worcestershire at the end of May, his return to a Second XI T20 match was aborted after just eight balls. With Seekkuage Prasanna on Sri Lanka duty until this weekend, Tabraiz Shamsi has arrived as cover for the opening three games. Gary Wilson will lead Derbyshire for the first time as he takes the reigns for the T20 campaign, but will be without Shiv Thakor after the all-rounder was suspended whilst under police investigation over indecent exposure allegations. The scorching conditions of the last couple of weeks, unfortunately, won’t continuing for the start of the blast. Showers are forecast for Northampton during the afternoon, but hopefully will clear to allow a game to take place. With a fresh pitch set to be used for the opening game, expect a high scoring encounter, as has been the norm for Wantage Road white-ball surfaces over the past couple of years.